Spring is finally here! While the Irish weather is as unpredictable as always, the daffodils and buds on the trees assure me that it has arrived. With each the new season comes an array of new fashion and beauty trends. Here are my six favourite trends. 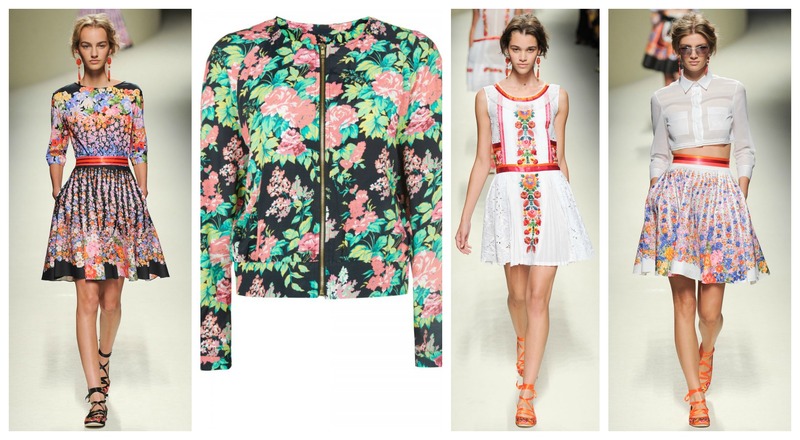 Alberta Ferretti Spring Floral runway looks and Primark Bomber Jacket, £15. Graphic floral blooms were heavily featured on the Mulberry and Christopher Kane runways at London Fashion Week. Italian designer, Alberta Ferretti displayed an incredible line of simple, white girly dresses with minimal floral appliques. Primark, which is now available on ASOS.com, already have numerous similar styles for sale at a fraction of the cost. If floral is not your style, Aztec is another print trend for spring. A pair of River Island or Miss Selfridge Aztec leggings with a plain block top is the best way to go when it comes to Aztec. 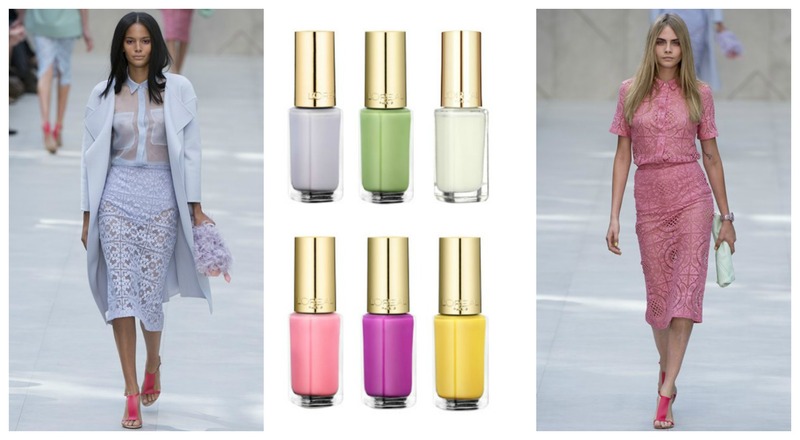 Burberry S/S 14 Pastel looks and L’Oreal Colour Riche Pastel Nail Polishes. Lilac, purple, powder blue and yellow hues were dominant on the Topshop Unique, Burberry, Matthew Williamson, and Versace runways. If you aren’t brave enough to wear the graphic floral prints next season, pastel colours are a great alternative. They’re soft girly and perfect for spring. Instead of head to toe pastels, pair pastel pinks, mints or blues with crisp white, cream or brown. A pastel cardigan with a white t-shirt and denim jeans is the best way to incorporate this trend to your spring wardrobe. The Topshop Unique collection will be available to buy later this year online and in store if you want an actual piece from the runway. Pastels nail polishes are a huge trend this year already. My personal faves include any from the Barry M Jelly Collection. L’Oreal also have an extensive range of pretty pastels this year too. All available at your local Boots or Superdrug. 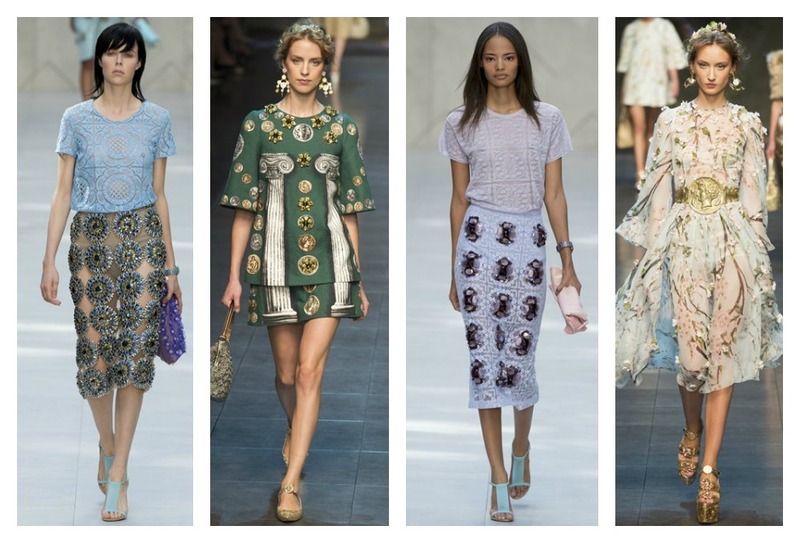 L-R, Burberry pastel embellished skirt combo, Dolce and Gabbana embellished florals, Burberry embelished skirt and Dolce and Gabbana belted and embellished dress. Burberry displayed heavily embellished looks at London Fashion Week, which the Highstreet will be quick to follow. To incorporate embellishments to your spring and summer outfits, opt for subtly. The Burberry S/S 14 line had embellished belts and skirts, keeping the rest simple. To keep costs low try updating accessories you already have with jewels and studs from craft shops. Classic black and white was heavily favoured on the catwalk by Marc Jacobs, Ralph Lauren and Fendi. Many of the designers opted to keep it chic with alternating black and white tailored trousers and blazers. To add some variety to this look, follow in D&G’s footsteps and opt for monochrome polka dots. Boohoo.com and New Look have an extensive range of monochrome to match any budget. Kate Bosworth wearing an Orange lip and a model from the runway sporting the trend. I’ll admit, it’s not for everyone but this trend is huge this season. From bloggers to the runways, the orange lip is taking over. Not a trend I’ll personally be sporting but when done correctly it looks great. Tori Birch, Burberry, and Ralph Lauren rounded sunglasses. Keep your eyes protected with rounded sixties style shades for the upcoming season like those displayed on the Ralph Lauren , Tori Birch and Burberry models. How very Jackie O! Let me know your favourite look for Spring 2014! This entry was posted in Beauty, Fashion and tagged 6trends, aztec, beauty, burberry, Fashion, floral, l'oreal, monochrome, nail polish, nail varnish, orange lips, pastel, Prada, print, ralph lauren, runway, s/s 14, spring summer 2014, Spring Trends 201, style, sunglasses, tori birch. Bookmark the permalink.